The SecPoint Penetrator is a vulnerability scanning device that simulates how a hacker could penetrate a given system and reveal vulnerabilities. State of the art Cyber Security Penetrator Vulnerability Scanner can help you to find the vulnerabilities on your entire network. You can scan your internal local IP addresses and your public IPs available on the Internet. Find your vulnerabilities automatically with the schedule scanning and get notified by email once new vulnerabilities are discovered. It comes with professional PDF & HTML reporting that will show you the evidence of vulnerabilities and information on how to eliminate them. The Penetrator is a powerful Vulnerability Scanning solution available as an appliance or virtual software. It is fully featured Vulnerability Management - Vulnerability Scanning. The Penetrator is a vulnerability management and penetration testing appliance developed for network use. It comes pre-loaded and ready to go with all sorts of invaluable pen-testing features no administrator can do with it. Indeed, it is a powerful and intelligent security assessment solution. Best Vulnerability Scanning Cyber Security Software. Discover IT vulnerabilities across your network. 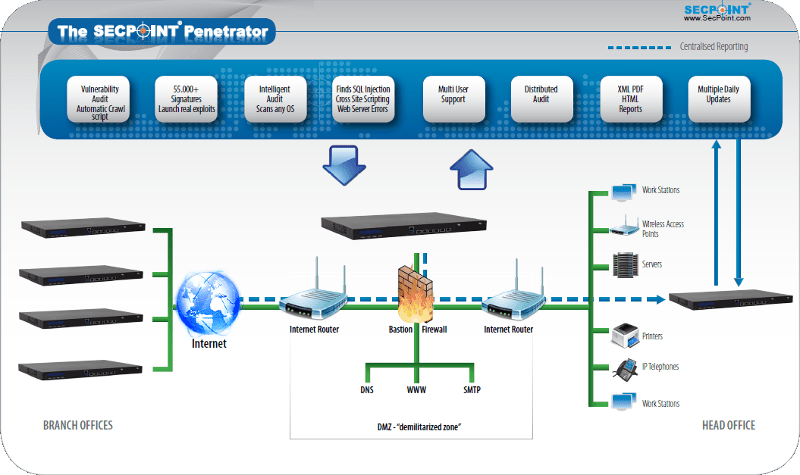 The Penetrator Cyber Security solution can find vulnerabilities in Firewalls, Routers, Linux, Windows Mac OS X, Mobile devices, Printers and any device with a local or public IP address. Features Vulnerability Assessment, Vulnerability Management, Launch real exploits. Clear solutions to found problems. Made in Denmark - Privacy Friendly - No backdoors or data collection. All data stored at customer site. Small For Factor (SFF) or Rack mountable appliances. Virtual support for ESXi, Hyper-V, or raw Linux ISO. For pricing please click here for our Cyber Security web store. or visit our partner directory for a local sales partner. Multiple Vulnerability Scanning profiles to choose from. Ticket system to easily manage found vulnerabilities with multi user support. Support for aggressive scans to launch exploits, Denial of Service. Full WiFi Penetration Testing capability for WEP, WPA, WPA2, WPS, DoS. Powerful WiFi Adapter included with extended 8 dBi antenna. High speed password recovery cracking engine. Around the clock fast live chat support 24/7. Fast easy and user friendly deployment. Customize reports with your own company name, watermark and logos. Multi user support in the interface. Have different users with different policy. Master / Node distribution support. Control multiple units centrally. Cost effective no cost per scan. Concurrent scans cost policy. Allowed to change IP addresses. CVE, Bugtraq, OVSDB, HIPAA compliance. Find vulnerable Memcached servers open to attack. Multiple format report for management, consulting and for tech. Multiple languages supported in reports. Launch Dos (Denial of Service) and DDoS Attacks. Brute Forcing, launch real Exploits. WAS, Web Application Vulnerability Scanning. Forum and 50 Other Black List checks. VAPT - Vulnerability Assessment & Penetration Testing. Prevent Hackers from entering your network and stealing sensitive information. No experience necessary to operate. User friendly to Setup. Performs vulnerability scanning of your public website and IPs along with your internal local IPs. 64 Bit Vulnerability Scanner High Power Support. PDF reporting that allows for custom report branding logo and name integration. It's a Plug and Play appliance. Includes both the SecPoint vulnerability scanner and penetration tester Vulnerability Scanning Capabilities. Penetrator has an IP address. So you just need to login to the web interface and configure the IP address. You can set it on the Internal or External network and reach the Penetrator administration interface from the Internet. Launch DoS and DDoS Attacks. 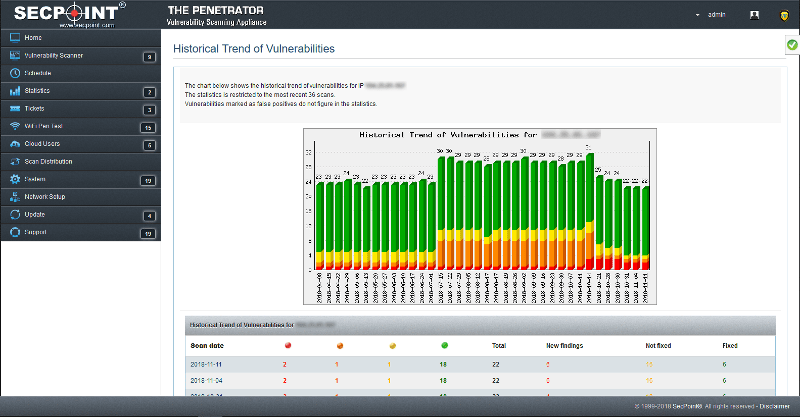 Penetrator - Identify and resolve network weaknesses before the attackers do! SecPoint delivers the best Vulnerability Scanning Appliances. Secure your network with the best Vulnerability Scanner. Vulnerability Assessment Joomla Security Checker, Joomla Vulnerability Scan. Advanced Vulnerability Scanning Profiles: Normal Scan, OWASP Scan, Firewall Scan, SEO Black Hat DB Scan, Extended Scan, SANS Scan, Aggressive Scan. Easily do Vulnerability Scanning & Vulnerability Management of your internal and external networks. Get more information about Penetrator Vulnerability Scanning Appliance. Penetrator Appliance is an ultimate vulnerability scanning appliance. It comes fully loaded with Automated functionality. CVE, Bugtraq, OVSDB compliance reporting. Easy to use scanning profiles for Normal scan, Web Scan, OWASP scan, Aggressive Scan, Firewall Scan, Extended Firewall Scan. Find out your cost of being compromised and discover your weak points before it is too late. With Penetrator Vulnerability Scanning Appliance you can deploy it in your network and do Vulnerability Management. You can scan Local and Public IP addresses. You will get detailed reporting in PDF,HTML or XML. It contains clear solutions for the identified vulnerabilities after the vulnerability scanning finished. You can easily setup scheduling and get notification once new vulnerabilities gets discovered. You can deploy the Penetrator Vulnerability Scanner as a Microsoft Hyper-V 2012 R2 2.0,3.0 software Image. Deploy for Hyper-V 2008 or earlier versions also supported. Detect Ransomware throughout the network. Find out if you are vulnerable to popular vulnerabilities exploited by ransomware. Read more about Ransomware here. Is the Penetrator the right solution for me? What hardware is used for Penetrator Appliance? The larger Penetrators are for maximum large scale vulnerability scanning. Multiple users on a Penetrator Appliance? Yes you can create multiple accounts with access to different IP addresses. Where can I see Penetrator customer references? Which Operating system can I scan with Penetrator? You can scan anything with an IP address. You can scan both local and public IP addresses. The operating systems includes Windows, MacOS, Linux,BSD, Unix, Aix, and many others. You can also scan routers, VoIP, firewalls and any network device. How do I install the Penetrator on the network? The Penetrator is very easy to install. It can be placed anywhere on your LAN. If you need to scan Internet devices, it must have an Internet access. The Penetrator is plug-and-play, so it's ready to work as soon as you connect it to the LAN and turn it on. You know right away if it works by simply trying to access the administration interface from a web browser in the LAN. Penetrator is a security Appliance unit you simple place on your network. How do I buy a Penetrator? We sell via our distribution channel of Distributors and Resellers. See our List of Contacts all over the world. Powerful 64 Bit Virtual, Hardware appliances. Virtual 64 Bit Hyper-V, ESXi, VMware & Linux ISO. All models come with a fully featured hard drive Minimum 300 gig size. In Larger models with SSD for increased speed. In many competitors you only get 32/64 gig flash and only larger models support hard drives but they get very expensive. Not limited to ASIC structure but real Linux server system that allows for full future upgrades. Can be placed in any network environment. The SecPoint Penetrator is a vulnerability scanning device that simulates how a hacker could penetrate a given system (hence the term) and reports vulnerabilities, which should then help strengthen security measures against online outlaws, virtual villains, cyber criminals, techno terrorists, and other nefarious elements of the Worldwide Web at large. The SecPoint Penetrator is a vulnerability scanner, vulnerability management of great significance because it's actually capable of simulating cyber attacks against systems so that they are better prepared for anything a hacker might have under his sleeve, so to speak. In essence, the Penetrator will scan your device, network, or database to ensure that it is vulnerability-free. To be more specific, vulnerabilities are the holes and coding flaws that hackers exploit so that they could wreak havoc on any supposedly secure website or domain. Their malware programs will likelier gain access to a given network if they could identify vulnerabilities that the network owner neglected to find. Therefore, the Penetrator is an essential reporting device that records in XML, HTML, and PDF all those minor-to-critical vulnerabilities before these online outlaws do. The Penetrator can scan most everything from public to local IP addresses. It's the penetrative scanner you require in order to guarantee that your security is "airtight" and "hacker-proof". Most importantly, the SecPoint Penetrator is a device that evolves alongside security technology, so you'll never end up with an obsolete appliance that requires replacement post-haste. The reason for that is because the Penetrator regularly connects to the Internet in order to get the latest security updates around. If there are white hat hackers who've recently uncovered some sort of vulnerability for whatever program or safety protocol around, you can rest assured that the Penetrator will be right on the case. Vendors will more likely have vulnerabilities patched immediately as long as their customers are aware of the danger and clamoring for action. The Penetrator helps make you more aware of the program holes and crevices that hackers and their malware can go through in order to destroy everything you've worked for. What's more, every time a new vulnerability is discovered, SecPoint databases are updated. The security company works round-the-clock in order to ensure that their products are always on top of the situation. You can even set your own the Penetrator device like an alarm clock so that it will provide you notifications and schedule updates every time code flaws and possible glitches are found. If you want to make sure that your network is secure instead of enjoying a false sense of security that will lull you into complacency until it's too late and you've already been hacked, then it's imperative that you go through penetration testing via the vulnerability assessment capabilities of the securely designed, user-friendly Penetrator. Vulnerability Scanning Vulnerability Assessment Penetration Testing Application Security Denial of Service DoS Tests Buffer Overflow Attacks Brute Force attacks With the 256 IP Penetrator Appliance you can scan 256 IP addresses at the same time via the vulnerability scanning. Customizable scanning profiles, which includes SANS/FBI Top 20 Comprehensive and Unlimited Vulnerability Auditing. With its all-inclusive vulnerability database and the application of sophisticated auditing techniques, Penetrator enables you to always be one step ahead of even the most skilled and advanced hackers. It has no limit on the amount of auditing you can do. Easily choose the number IPs you want to scan. Therefore, it is most certainly one of the strongest and most comprehensive vulnerability assessment solutions on the market today. With the Penetrator Appliance you can launch scans of public and local IP addresses. It comes fully loaded with Vulnerability Scanning Capabilities. Penetrator offers the best technology to doing vulnerability scanner. It will scan Routers, Firewalls, Windows, Linux, MacOS, IP Telephones any system with an IP address for vulnerabilities. High Power 64 Bit Multi Core architecture. Easy Graphics User Interface GUI and live chat support is included. No backdoors - No information collection - All data stored at customer location. Every day 24/7 Live Chat Support.